WTI crude prices have continued to fall, and they are in the range of $48.00-$48.50/b this morning. WTI opened at $48.45/b today, a major drop of $1.16 below Friday’s opening price. Current prices are $48.30/b, a drop of $0.19 below Friday’s yesterday’s close. Prices have been stable in this range overnight, as the market looks for additional guidance today. Diesel opened at $1.5116/gallon in today’s session. This was a drop of 2.39 cents (1.56%) from Friday’s opening price. Current prices are $1.5085/gallon, a recovery of 0.49 cents from Friday’s close. Gasoline opened at $1.5946/gallon today, a drop of 3.04 cents, or 1.87%, from Friday’s opening. Prices are $1.5881/gallon currently, a drop of 1.2 cents from Friday’s close. The suddenness and extent of the market downturn has come as a surprise. 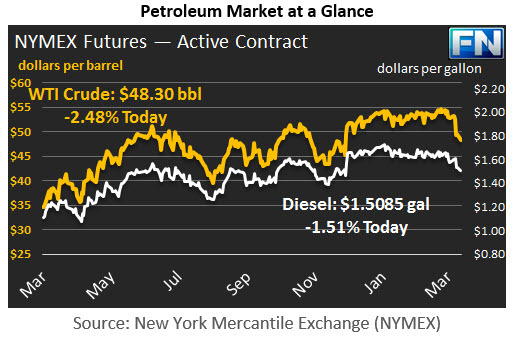 The market is pondering “Why now?” and “How far will prices fall?” After all, some bearish fundamentals (rising U.S. rig count, rising U.S. production, and a steady increase in crude inventories) have been a constant feature in the market since January. Long positions in crude nonetheless were seen as a good bet, given the high levels of OPEC compliance, combined with warnings that low levels of investment in the upstream sector would ultimately create another shortage. Some investors also expressed a belief that investing in oil could serve as a simple hedge against rising inflation. Commodities and equities in general have declined in value, however. Today’s opening WTI price is $4.74 below last Monday’s opening price, a major loss of 8.9% value. Some technical analysts believe that WTI prices falling below $49/b can signal a larger downturn to approximately $47/b. Traders will be watching for a breakthrough below this level, or possibly a bounce-back and then another collapse. U.S. supply fundamentals remain bearish, with Friday’s rig count rising once again, by 12, and Platts reportedly calculating new break-even prices in the range of $35-41/b for some key U.S. oil finds. The Saudi Oil Minister noted that global inventories were not declining as fast as anticipated, which contributed to lack of confidence in prices. OPEC and Non-OPEC participants in the cuts will have to reassess their strategy and find a new way to add price support this week.